On the coastal waters of Jangjwa-ri, is a flat island called Jangdo (a.k.a. Janggunseom) that looks like an upside down abalone. The distance to Jangdo from village is approximately 180m, and Jangdo can be reached on foot twice a day during low tide. This is a historical site of Cheonghaejin conquered and developed by ChangPoGo, a famous admiral in the unified Silla Dynasty. Here, admiral ChangPoGo built Cheonghaejin and conquered the pirates to gain the maritime power and contributed to bring ruling power of maritime trade between Silla, Japan and the Tang Dynasty. 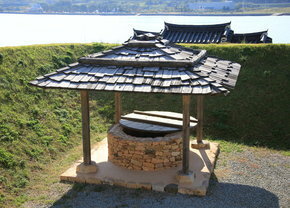 It is known that there were outer and inner castles at Jangdo, which are being recovered in historical heritage project. Many historical sites and valuables including roof tiles and pots giving glimpse of the splendid lives at that time are being discovered throughout Wando, and during the low tide, the hint of wooden fence around the island to protect Cheonghaejin from the Southern foreshore of Jangdo is revealed. 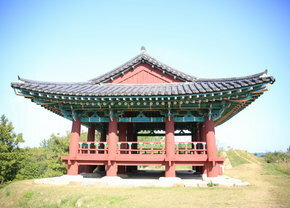 Historical sites include Cheonghaejin castle, Wadangpyeon Dasu, Togipyeon, shrines and the site for Beophwasa. Wooden Fence: Approximately 1,000 wooden fences of 40-80cm in diameter are discovered from the Southern and Northwestern beaches of Jangdo. Millstone: A millstone of 1m in diameter and 30cm in thickness is remaining at the center of island. Its shape is similar to those found in China. Beophwasaji: A site for many large buildings is found from five staircases at the foot of Sanghwangbong at the back of Jangjwa-ri. As access to historical site of Jangdo Cheonghaejin is possible only during the low tide, a bridge was built to aid acccess of visitors at any time of day. 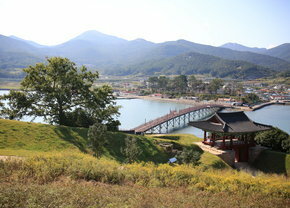 To focus on the superior performance of ChangPoGo, a maritime king, recover the old glory of splendid Cheonghaejin and to succeed the maritime pioneering spirit and challenging spirit of ChangPoGo engraved in the minds of people after being resurrected from 'Haesin', a worshipping shrine was built as a historical education site. Click each button for details.